Van Dijk is the most expensive defender in world football. VIRGIL VAN DIJK is “the best centre-back Liverpool have had since Alan Hansen”, says Graeme Souness, with £75 million well spent on the Dutchman. The Reds broke their transfer record prior to the January window opening as they put a big-money agreement in place with Southampton. Van Dijk, who is reportedly set to miss today’s Premier League match against Manchester City through injury, had been a long-standing target for those at Anfield, with Liverpool’s defensive frailties well documented. Jurgen Klopp eventually got his man and Reds legend Souness believes the 26-year-old has the potential to follow in some illustrious footsteps on Merseyside. 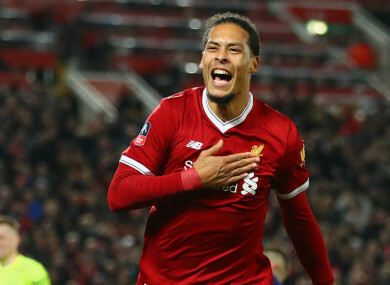 He wrote in a column for the Sunday Times: “Virgil van Dijk is the best centre-back Liverpool have had since Alan Hansen, but the 26-year-old Holland international is better in the air than Alan was. He always plays within himself, which is a great sign. In Souness’ opinion, Liverpool’s gain when it comes to Van Dijk has been Manchester City’s loss. The Premier League leaders were also heavily linked with a move for the Netherlands international, but Pep Guardiola ultimately missed out and is now having to explore other options. Souness added: “The ball is an enemy for Eliaquim Mangala. He’s in the wrong movie at Manchester City. “They are always going to play out from the back and he doesn’t want the ball, so you would target him. City will get a close look at what they missed out on this weekend when they make the short trip to Anfield for a crunch Premier League clash. Email “Van Dijk is 'the best centre-back Liverpool have had since Alan Hansen' ”. Feedback on “Van Dijk is 'the best centre-back Liverpool have had since Alan Hansen' ”.